But as high profile as Bowie’s legendary collection may now be, is it really fair to say that Modern British Art is just for the reach of the home market? I think that argument is becoming increasingly hard to make as reflected in the strong prices achieved in this field at the sales held in London by the major auction houses. The Modern British & Irish Art market saw a buoyant 22% increase on last years’ sales in London as a whole. Take Christie’s for instance, which has an impressive 76% share of the Modern British market, seeing over £62 million in sales this year. Their foresight of holding the Modern Brit sales to coincide with Impressionist and Modern art sales, helped to make Modern British art more accessible to the international audience commented Colin Gleadell in The Daily Telegraph Online. New auction records were set for Henry Moore, Lynn Chadwick, Bridget Riley, Duncan Grant, Stanley Curister and Frank Auerbach. Notable examples include Moore’s Reclining Figure: Festival, 1951 going above estimate at £24,722,500 at the Christie’s 250th anniversary Defining British Art sale in June this year. The increasing international edge has also been felt by Bonhams this year. The 246 registrations at their June sale were drawn from 15 countries seeing 85% sold by lot overall with 46% selling in excess of their upper estimates. The single owner collection of C.S Reddihough was 100% sold with artist Henry Moore once again showing strong results. His plaster Reclining Figure (1945) sold for £1.8 million. The demand for 20th and 21st century sculpture continues to rise, with works by Turnbull and Chadwick being particularly competitive. This has been helped, one expert told me, by a lack of top quality sculptural works available in the impressionist as well as contemporary market, thus the international buyers are complementing their collections with modernist British art. He also mentioned the dark undertone to post-War British art, a visual style which was previously not that popular. Yet this “almost sinister undertone” is very contemporary now and as a result resonates with collectors. The recent showing of Barbara Hepworth at the Kröller-Müller Museum in Otterlo, Netherlands earlier this year, nearly fifty years after Hepworth herself visited what she described as “wonderful conditions and surroundings” has helped to re-introduce Modern British Art to a new audience which has undoubtedly had a positive knock on effect to the market. Other artists like Bridget Riley have also had more of an international showing. Paris ‘Galerie’ Max Hetzler has shown recent black and white Riley works, featured for the first time last year and great examples of her reorientation in terms of structure and colour since the rigorous black and white paintings of the 60s. Despite the auction house bonanza we have seen, we are still in for an interesting few months ahead. 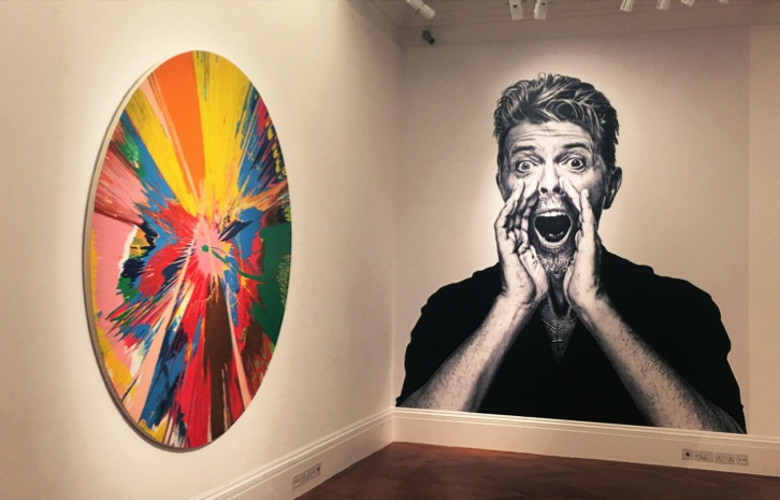 Sotheby’s decision to have preview exhibitions of Bowie’s collection in destinations as far as Los Angeles, New York and Hong Kong speaks for itself. From the 1st-10th of November, the collection will be exhibited at Sotheby’s New Bond Street galleries in what they say could be a “once in a lifetime opportunity” to immerse yourself in the objects of his private world. What Bowie would make of it all we don’t know, but for the time being fans, art lovers, collectors and experts should have a lot to thank him for.